It's really that simple, but generally you’d want to end your research within Amazon’s marketplace. Finding products that are selling well plus have an opportunity to improve upon. You can improve on a product in many ways, but first let’s get some housekeeping in order. Selling on Amazon can come in a few forms, but today we are going to talk about private labelling products. We believe private labelling is a more defensible business model than reselling products and the work isn’t really that much more. You gain ownership of the product on Amazon’s platform, plus you’re building an asset for the long haul everywhere else. Setting up your brand on Amazon is the biggest hurdle but it’s pretty simple if you follow our Amazon FBA tutorial here. Record product ideas on the go with the Evernote app. Keep your eye out for anything interesting. Always be on the lookout. It’s just a matter of turning on your product awareness switch. Large branded grocery stores are great places to look for private label examples. Many of the products on store shelves are private label products themselves and the store itself may have a private brand. Magazines are especially good for finding evergreen niches. One’s that have a dedicated fanbase and are stable but evolve with different products. Think of the photography niche, it’s changed in many ways but overall you still need to buy a camera (and case) to participate. Have your evernote open all the time and record everything, no matter how dumb it seems. Just let the creativity flow and you can do a deeper dive later on when you are back on your computer. Personally, this is my favourite way of researching private label products. Not only can you stay in the comfort of your own home, but you can do the macro analysis right after. More on macro analysis later though. Reddit.com - The world’s biggest forum has to be on this list. A few subreddits I like to look at for product ideas are /r/shutupandtakemymoney/, /r/BuyItForLife/, and /r/GoodValue/. Once you are in these subreddits, head over to the Top section and browse around for the most popular threads of all time or the past year. There’s definitely some golden nuggets for trending products. Reddit’s top section within the shutupandtakemymoney subreddit. Kickstarter.com and IndiGoGo.com - These are the biggest crowdfunding sites in North America and a great place to start some research. Just because these sites are meant for innovative new products - doesn’t mean you can’t steal the basic premise of the product. In fact, Amazon has launched a special area just for crowdfunded and venture funded products. They call it Amazon Launchpad. For example, people are always trying to raise money for a better water cooler or airplane pillow. And although these product creators might be onto something if they reach their crowdfunding goal, a lot of these innovations are unproven but can still lead to some good ideas further down the line. 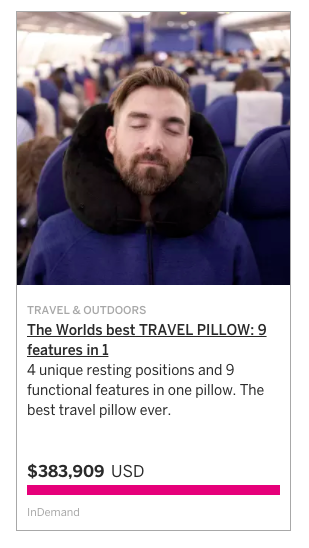 A funded crowdfunding campaign for a travel pillow on Indigogo. TrendHunter.com - Although not the best place to find proven product ideas, there are plenty of good marketing and packaging ideas for when you’re ready to launch. The products found on this site are often categorized by either products or trends. Such as ‘furniture’ or ‘home’ and are more like top lists. It’s fun to take a look at these every now and then to spark your brain with new trends. TrendHunter’s top list of trends from around the world. DutyCalculator.com - This is an awesome list of popular import products that you choose for any country. If you want to see what’s popularly being imported from China to the US - no problem! We can’t take all the credit for this though, Richard Lazazzera’s post on top products listed this as one of their go-to resources. DutyCalculator will show you trending imports to and from any country. Shopping.ThinkWithGoogle.com - A project that’s not well known to a lot of people but is very useful for those selling into the US. It’s very similar to Google trends but instead of showing you a line chart of searches, Google shopping insights shows you the searches across a heatmap of the United States. 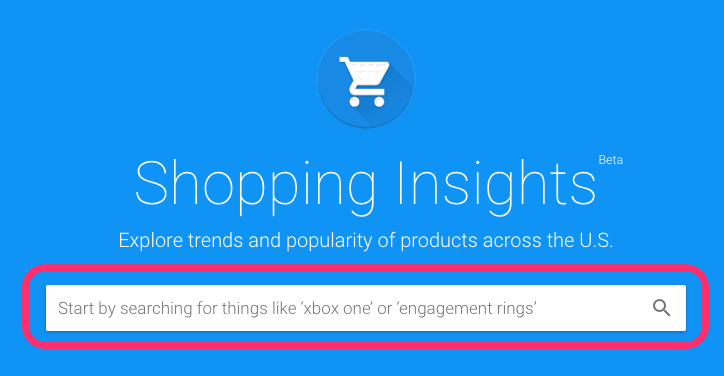 You can use Google shopping insights, Google trends, and Google Correlate in conjunction to validate product trends. Google Shopping Insights places search trends on a heatmap of the United States. NicheHacks.com - A great resource from our friend Stuart Walker on different niches all over the world. Stuart is a super affiliate but his site is useful for finding physical product niches too. He wrote a review of Amasuite﻿ recently, but take a chance and explore his articles in depth. The headlines are great and you can learn a thing or two about writing good call-to-actions. Amazon.com - The world’s largest online retailer is exactly where you should start reverse engineering your next product idea. There are other online marketplaces like eBay and AliExpress but seeing what your desired market wants would be the best idea. 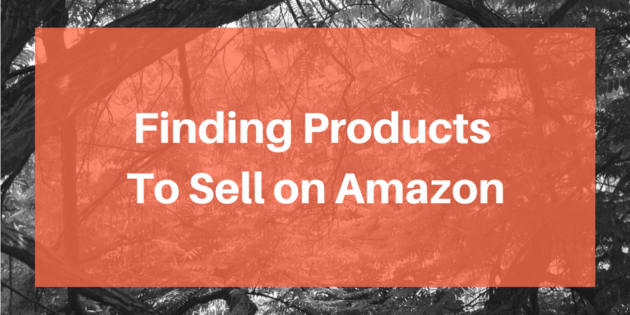 The Best Sellers section on Amazon is the easiest way to find profitable products to sell. The best place to find successful products on Amazon is to look at the best sellers list. Although only one of many lists on Amazon, it’s the one with the top selling products from every single category. The keyword to pay attention to is ‘selling’. Why should we pay attention to the products sold? Because they represent the best opportunities for us to enter. You don’t want to launch your product to crickets. You want to launch your product to a hungry market. One that’s already consuming a certain product and the best scenario would be that the product they’re consuming isn’t very good. All of the Amazon categories and lists are available for searching inside Amasuite’s Top Product Analyzer. Amazon’s complete category list is found inside Amasuite. The best seller’s list shows the top 100 products in every category (including subcategories.) Which is a lot obviously, so how do you know which products offer the best opportunity? The Price Should Be Lower To Be Affordable, But How Low? The price of a product should float above $20. This is a good price point to start with because it provides enough margin, dollar-wise, for you to put back into the business. Anything above $50 isn’t unreasonable, but just realize that the higher you go - the less inventory you should hold because you won’t be selling as many units. The Top Product Analyzer and Search Analyzer in Amasuite will allow you to filter your searches by price quickly. The Best Sellers Rank (BSR) is a number from 0 to infinity that represents how well a product is selling within its main category. The only BSR you want to pay attention to is the main category. The sweet spot for a non-competitive product is 1,001 to 10,000. This means that there are at least 1000 products selling better (in that category) than the one you are looking at. The Top Product Analyzer provides an opportunity score for all the products that lay within this range. But you can also adjust the ranges as well. Some people with larger capital spends can go for more competitive products since they can invest more on product differentiation and advertising. 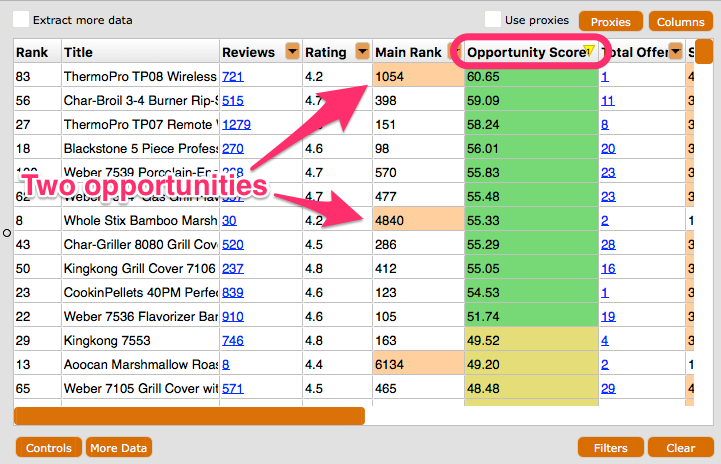 The opportunity score in Amasuite showing two private label opportunities in the data table. Another thing would be to look up the product’s price and BSR history. Sometimes a product can have a low price and BSR. This might be tricky because they’re currently launching their product and that price and BSR can change wildly throughout the day but will eventually settle. Amazon lists products in 2 ways: Standard and Oversized. Within both of those ways, your product can either be small or large. For example, small standard or large oversized. For more clarification, you can head over to Amazon’s product size tiers. In any case, try to stick to standard sized products that are between 1-20 lb’s (pounds) with the longest dimension being 12 inches. The reason why a smaller, lightweight product is better to sell on Amazon is because you’ll be able to ship the product by air. Which is much faster than by boat. This will serve you well, not only in the product research phase, but also when you inventory has turned over and you need to order more for Amazon. With smaller items as well, you’ll get the added benefit of being an ‘add-on’ type of product since many people purchase more than one item from Amazon because they have to wait for shipping and would rather get other small items that aren’t immediate needs, but are on their shopping list for later. There are two things you want from reviews: Lots of them and Poor Reviews. You are going to hear a few people say that you want to find products with less reviews that are still selling well, but for Amasuite, we utilize the reviews for determining product modifications. We can use the thousands of reviews for that product (plus it’s competitors) to find some commonalities. Generally, a product with that many reviews will have some people mentioning common problems with the product. And where are they going to leave their product complaints? In the reviews! 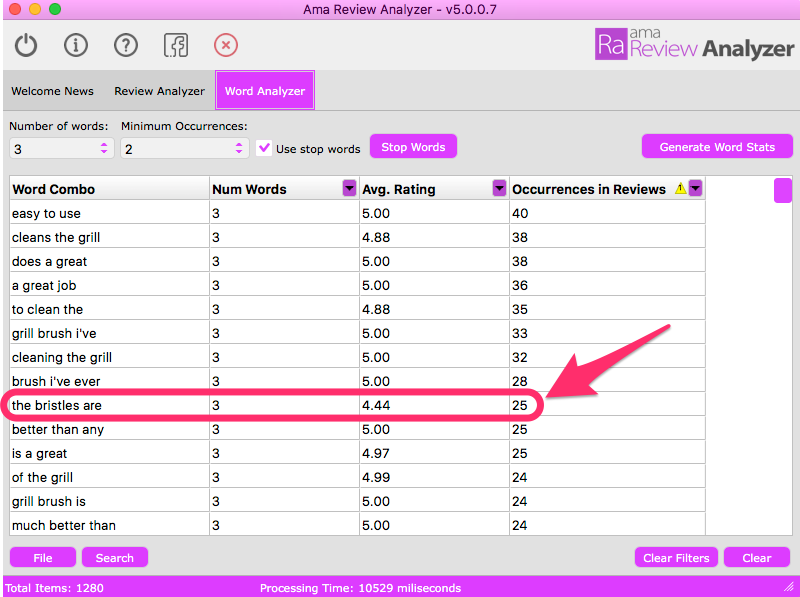 Amasuite’s Review﻿ Analyzer looks at all of the reviews for a particular product and organizes them by the most commonly said phrases. The best phrases have to do with a particular part of a product. For example, the review analyzer would find 25/1000 reviews for a BBQ brush mentioning “the bristles are”. The Review Analyzer helps to find product modifications based on collected reviews. Listings have three essential ingredients: the title, description, and photos. A good example of a highly converting Amazon listing. Optimizing your title and listing means getting the essential keywords into the right places. For keywords, you want to include the ones that have the highest relevance to your product but also the highest searches. The keywords with the highest searches are always in the suggestion box from Amazon. 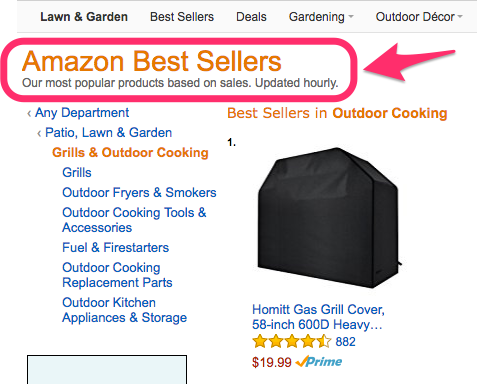 For example, once you start typing up “bbq” into the search bar, Amazon will suggest a number of products for you. Search suggestions are exactly what Amasuite uses to increase listing traffic and optimizations. Keep an eye out for weak listing titles, it’s a bit difficult to see from first glance but a well optimized title would have several ways of describing the product. For example, a ‘BBQ grill brush’ is the same as a ‘barbecue cleaning brush’. Phrases with the same meanings can be placed into your Amazon titles to increase your impressions. 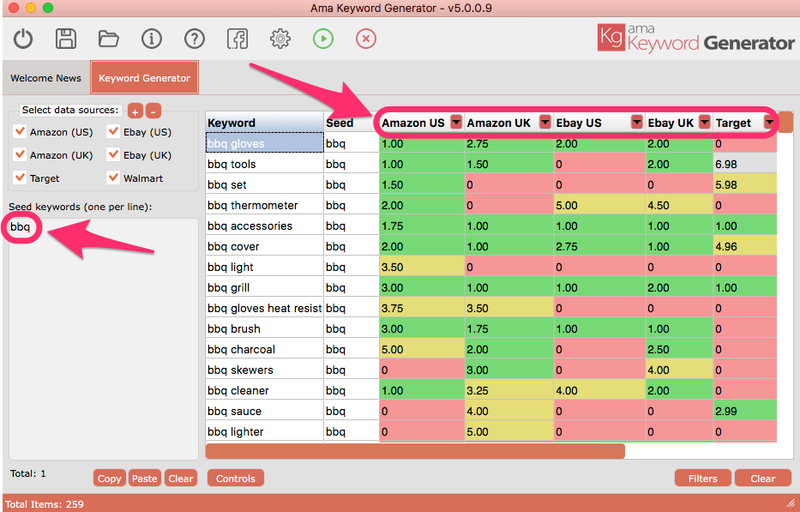 To find keywords quickly to add into your title, you can use Amasuite’s Keyword Generator. The keyword generator does exactly what you would do as a human, but it uses software scripts to the type in “bbq a”, “bbq b”, “bbq c”, etc. 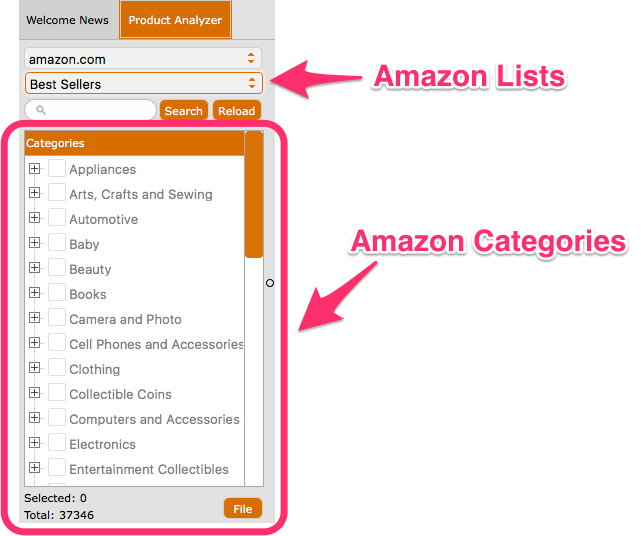 making it much easier to find keyword suggestions from Amazon’s search bar. Amasuite’s keyword generator extracting search suggestions from Amazon. Another quick win would be to keep an eye out for listings that have poor descriptions. Poor descriptions have terrible copywriting and don’t overcome the issues described within the reviews. If a product doesn’t have multiple bullet points, that’s another negative for that listing and you can chalk it up as an opportunity for you. An example of poor copywriting and not using all of the space available from Amazon. I think we can all agree that product photo’s are important, if not the most important aspect to your listing. The photos are your 24 hour sale’s person and help to demonstrate the product’s use cases, size, and design. Amazon has specific image requirements and you’re allowed a total of 9 photos to help sell your product. Look over the image requirements first before finding a photographer. The image is too ‘busy’ and has too many aspects included. It should only display what the customer is going to receive. Less is more in this area. They aren’t using all 9 photo slots. The images aren’t in high definition. There are no photos showing how the product is used. How Durable Should a Product Be? There are many products that exist to last a lifetime, but there are also many products that are only designed to last a few years. One characteristic to look out for is whether the product is a consumable or not. How often are people replacing the product? If it’s used once, is it gone forever? There isn’t really a direction to point you in with this, but it’s something you should think about. Having a consumable product inspires recurring revenue - if your product is good of course. One example of a product that people often replace is headphones. People’s headphones break from wear and tear all the time, and more times than not - they’ll buy the same headphones again if the product is within their price appetite. Is a Trending Product Better than an Evergreen Product? The simple answer is no. They both offer opportunities that can be well worth the endeavor. You can look up the search trends of a product through Google Trends, from there you can find the seasonality as well as the upward or downward interest of it online. Based on the number of Google searches over time. Google Trends is integrated into Amasuite’s Top Product Analyzer and Search Analyzer. The perfect product would be one that is just starting it’s trend, but has enough demand to validate it and will continue being an evergreen product in the future. But that’s impossible to predict so our best suggestion is to find evergreen products that have a solid BSR history but terrible reviews. Reverse engineering what is already selling well on Amazon is your best product research tactic and once you’ve selected a few products to try out, let’s look at where you can find a supplier. Two platforms for you to find manufacturers is Alibaba and AliExpress. They’re both under the Alibaba brand but Alibaba is specifically for ordering from private label manufacturers. AliExpress is where you’d order less quantities of a product, but would not have your branding or modifications for it. AliExpress is simply just a way to test the market. You will have less margin and might even lose money initially, but there are definitely arbitrage opportunities where you will find the exact same product selling for less on AliExpress than on Amazon. We actually created a tool just for sourcing products on AliExpress first, it’s called the Ali Inspector. 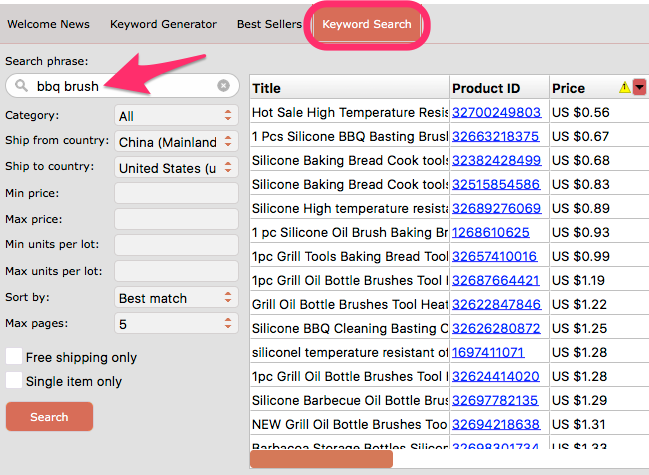 There’s essentially three parts to the Ali Inspector tool: a Keyword Generator, Best Sellers Search, and Keyword Search. The Keyword Search tool is probably the most useful in this situation. Since you already know what you are looking to sell on Amazon, search for the keyword in the Ali Inspector software. The Keyword Search tool is 1 of 3 tools included in Ali Inspector. Most of those aspects are fairly similar to what you want to see from an Amazon listing, but the three that are different are packaging, ePacket delivery, and delivery time. With packaging from AliExpress, you want it to be solid and not completely branded. Because eventually you’re going to be switching over to your own version of the product. EPacket is a delivery system used to deliver small packages from Hong Kong to the US with minimal cost and speed. So it’s definitely something you want to have included into your product deliver. Finally, delivery time just means how long it will take for your product to be delivered to you. If the seller has ePacket activated, then you’ll get your product much faster. We should note that many people in our community are using Ali Inspector to find products first by using the “Best Sellers” tab in the software and then cross referencing products they find on AliExpress with Amazon and seeing if opportunity exists for profit. Alibaba is similar to Amazon, but instead of sellers connecting sellers with retail customers - it’s for manufacturers to connect with private labellers. When you first enter the Alibaba platform, enter your product type in the search bar and your screen will populate with manufacturers ready to take your order. Alibaba is the best place to begin searching for manufacturers of your private label product. An example of an acceptable manufacturer to reach out to on Alibaba. Gold suppliers have passed an onsite inspection from Alibaba and each year a manufacturer is on the platform, there will be a number representing how long they’ve been a gold supplier for. A response rate of 60% and at least 1 transaction in the last 6 months might be low, but as long as they have a gold supplier membership then you will be ok. Many of these businesses deal with business offline as well, Alibaba is just one source of revenue for them. Often times a manufacturer will pay more attention to trade shows where they can meet people face to face. Be mindful that a gold supplier doesn’t mean their product quality will be up to your standards. Each of us will have different expectations and be in differently competitive niches, where the quality of products varies. Sometimes if you are entering a more obscure niche, you may have a more difficult time looking for suppliers. For which you’ll have to supplement your search by using Google. Know how many products you want, we suggest asking for three tiers of pricing. Determine if there are any minimum order quantities. Order multiple samples from a single supplier. A lot of these aspects are covered in the training that comes with Amasuite’s software package and if you’d like to learn more about the entire Amazon private label process, then give the software, training, and private community a shot today.